Start packing your bags you have found the perfect location for your beach vacation! 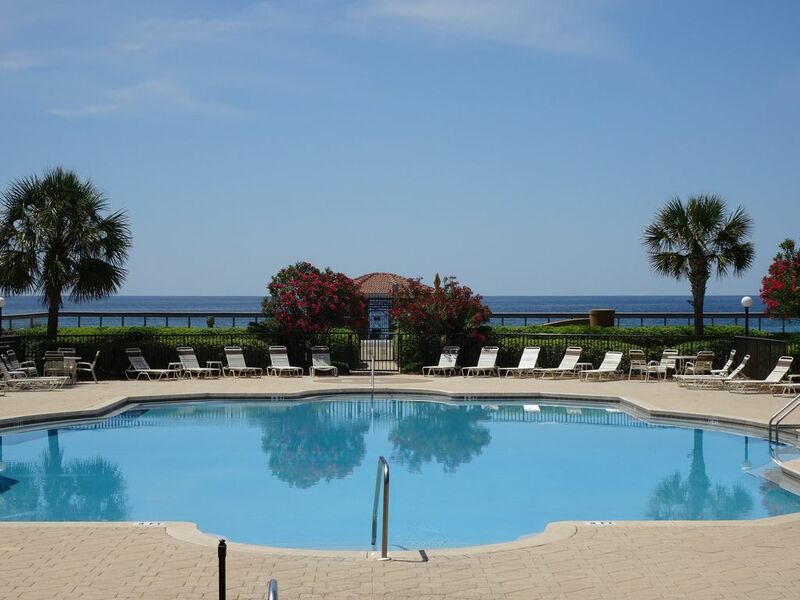 The Mediterranea of Destin, Unit A402, is a luxury 2 bedroom, 2 1/2 bath condo with stunning, unobstructed Gulf views. Not even the palms trees will block your view of the emerald waters and sugar white sand from our condo's balconies. The complex is perfect for couples and families alike. Our condo features a 'keyless' entry. Enjoy Free wifi and seasonal beach service consisting of two chairs and one umbrella during your stay with us. The master bedroom has a king bed, TV, DVD player and a spacious bathroom complete with a relaxing soaking tub, separate shower. Enjoy the spectacular view of the Gulf of Mexico from the master bedroom's private balcony. The second bedroom has two full sized beds and also features a private bath and balcony. Our living room is tastefully decorated. Sit back in comfort on the sofa and love seat while watching our 47 flat screen television. Step out on to the spacious balcony and you just might spot dolphins playing near the shore. The kitchen is fully-equipped with all the comforts of home. Beautiful surroundings coupled with emerald waters and soft, white sand beaches make for a vacation you'll wish would never end! Mediterranea offers an outdoor hot tub and gorgeous pool surrounded by an expansive sundeck and tropical garden landscaping. Enjoy a game of tennis or keep up your exercise routine at Mediterranea's fitness center. Connect with family, friends or the office with our free wireless internet service. Whether you are looking for a fun, family vacation, or a relaxing, retreat at the beach from your daily routine, the spectacular beauty of the white sand beaches, emerald waters, and the comforts of our 2 bedroom condo at the Mediterranea of Destin will meet your expectations. Please take a moment and make your reservation now! Seasonal complimentary beach service includes two chairs, one umbrella from March to October. Winter guests - note that our condo has carpeting in the living/dining area and both bedrooms! We spent many wonderful vacations with family & friends in the Destin/Miramar Beach area before we decided to purchased our condo. We love the outstanding views of the sandy beach and emerald waters of the Gulf of Mexico. We are Gail and Chris Iacovelli from Naperville, Illinois and are an owner-managed property. Mediterranea is gorgeous and well maintained. This is the complex everyone stops to admire. Our location is excellent as Mediterranea is directly across the street from the beach. We are close to Silver Sands Factory Outlet mall, Destin Commons, many fine restaurants and golf courses are just minutes away. You can walk to Pompano Joe's restaurant for a quick bite to eat! 4-5 night stays are honored off season-send us an inquiry for available. Springbreak, Summer and Fall break Season stays are Saturday to Saturday. Gorgeous, full unobstructed views of the Gulf of Mexico, we are directly across the street from the beach with private beach access. No buildings or trees to block your view. The white sandy beach and emerald water of the Gulf are both visible from our balconies. We have 3 balconies with outstanding unobstructed gulf views!! Fully Gated Property, Tennis court, Hot Tub, Gorgeous Pool & Deck, Private Beach Access with Gazebo Complimentary Seasonal Beach Service consisting of one umbrella and two chairs.